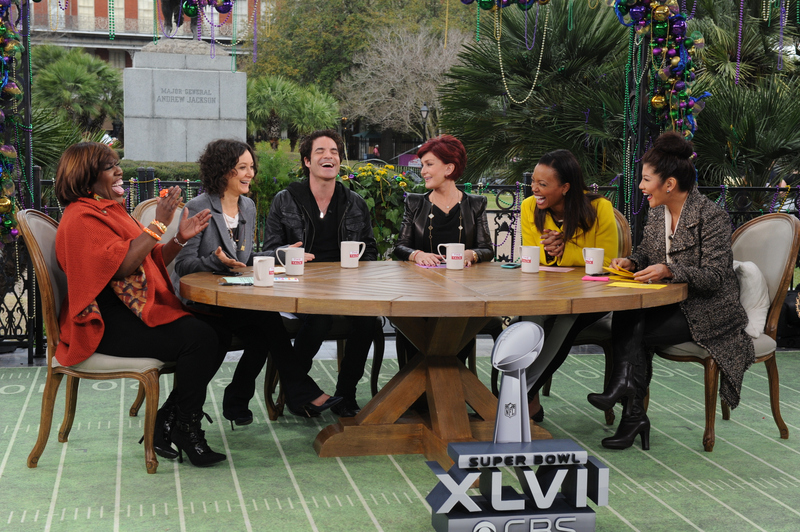 Pat Monahan, lead singer of Grammy- award-winning band TRAIN, guest co-hosts THE TALK in New Orleans, Tuesday, January 29,2013 from CBS Super Bowl Park at Jackson Square in the heart of the historic French Quarter. Beginning today, Train will be the show's house band all week long in the Big Easy. Sheryl Underwood, from left, Sara Gilbert, Pat Monahan, Sharon Osbourne, Sheryl Underwood and Julie Chen, shown. Photo: Heather Wines/CBS ©2013 CBS Broadcasting Inc. All Rights Reserved.